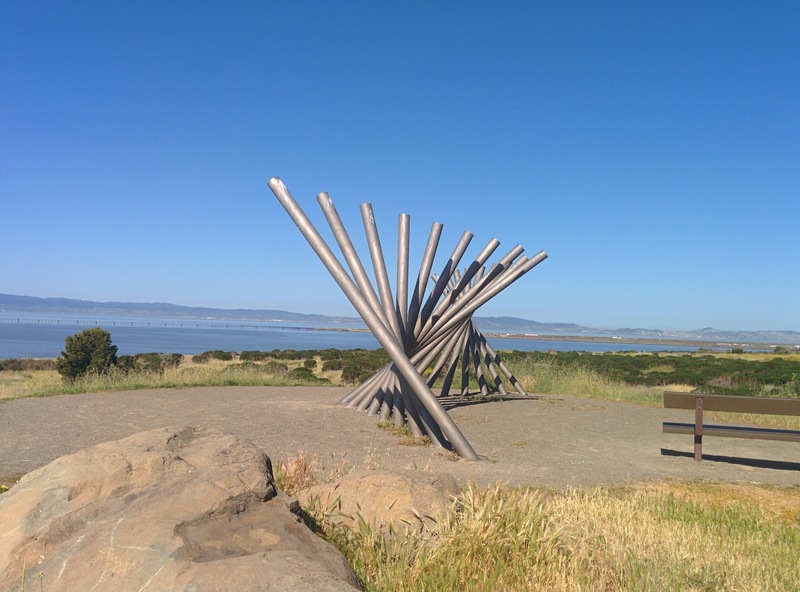 Another one of our standard places to romp when we are in the San Francisco East Bay Area is the Oyster Bay Regional Shoreline (716 KB pdf park brochure). 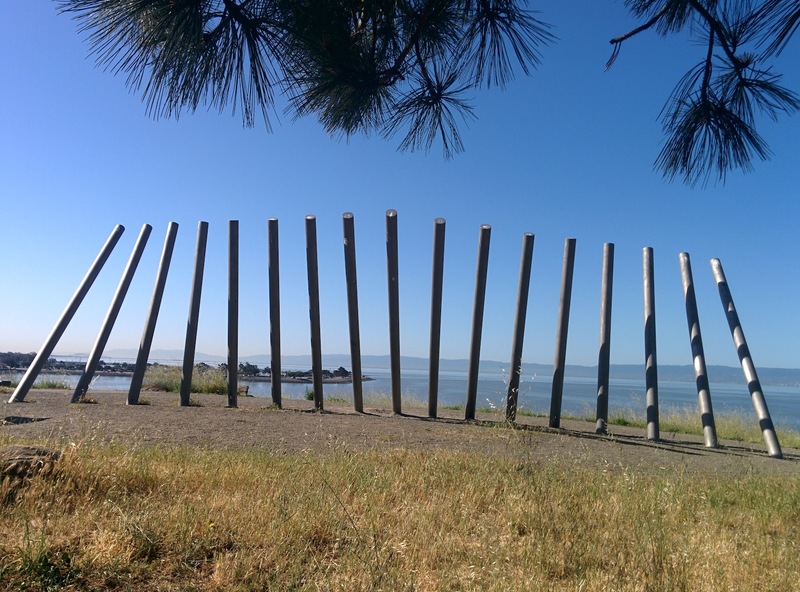 Along with Point Isabel and the Albany Bulb this makes up our tried and true triad of quick, easy, fun and quality places to tire out your pooch and get some great views of the surrounding San Francisco Bay environment. As an extra, added bonus this park is wheelchair accessible. Not all the trails we like to frequent are suitable for wheelchairs but, from the parking area to the picnic area and all around the paved path along the perimeter of the park are easily accessible. Like Point Isabel this regional shoreline was once a landfill although for residential garbage as opposed to Pt. Isabel which was, as I understand it, the dumping spot for several battery factories. You can regularly find rusting battery terminals and thick, black plastic pieces of battery casing poking through the soil at Pt. Isabel whereas here the usual piece of detritus we find is pieces of old plastic garbage bag that have worked their way up through the soil over the decades since the landfill was closed in the 1970’s. The parking area is just along the sides of Neptune Drive which help to keep the crowds down. 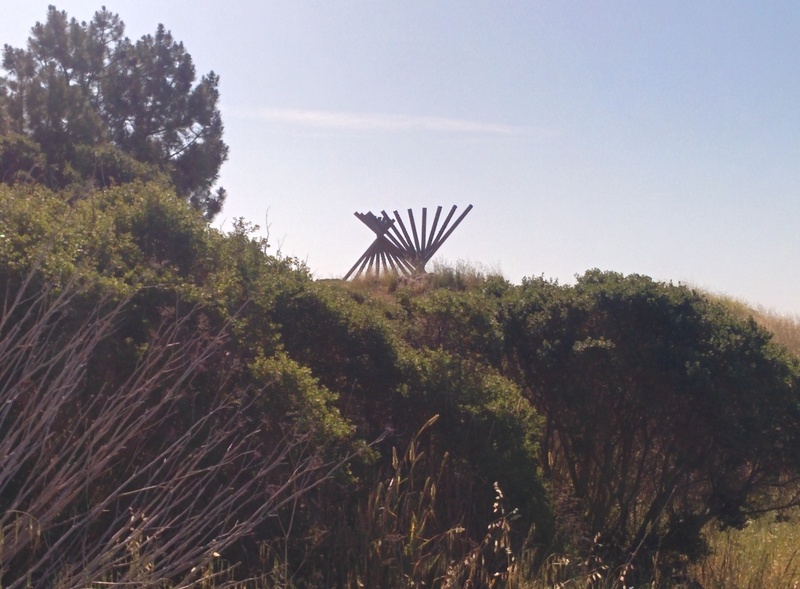 As an example, Fort Funston has parking spots for maybe a hundred cars. Here and at our other two East Bay spots maybe dozens of cars can park in the general area. 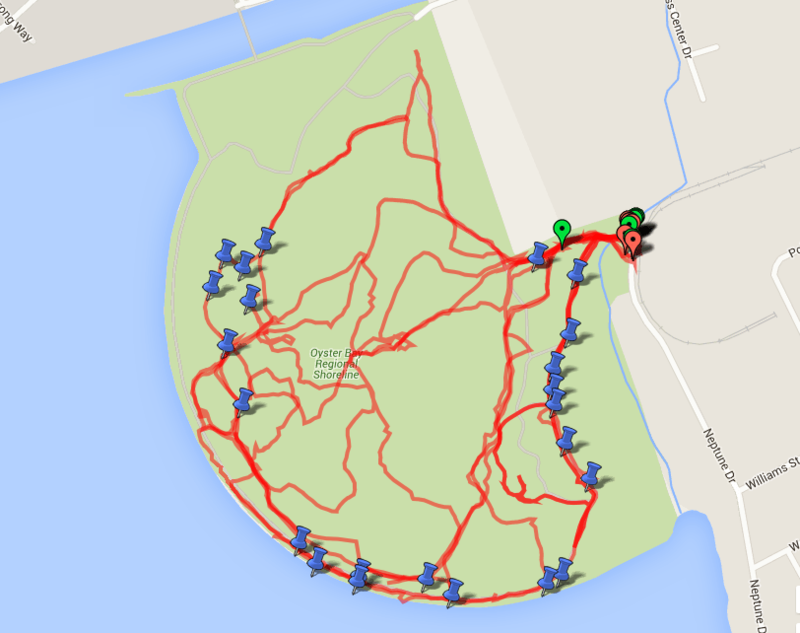 An Aggregate of Several of Our GPS Tracks Over the Area. Blue Pins Are Testing Wells. Once you reach the point where off-leash fun is allowed (about 20 meters past the water faucet and garbage can near the entrance) off comes the leash and I usually play “Follow The Dog” with Willow in the front going wherever her nose leads her. 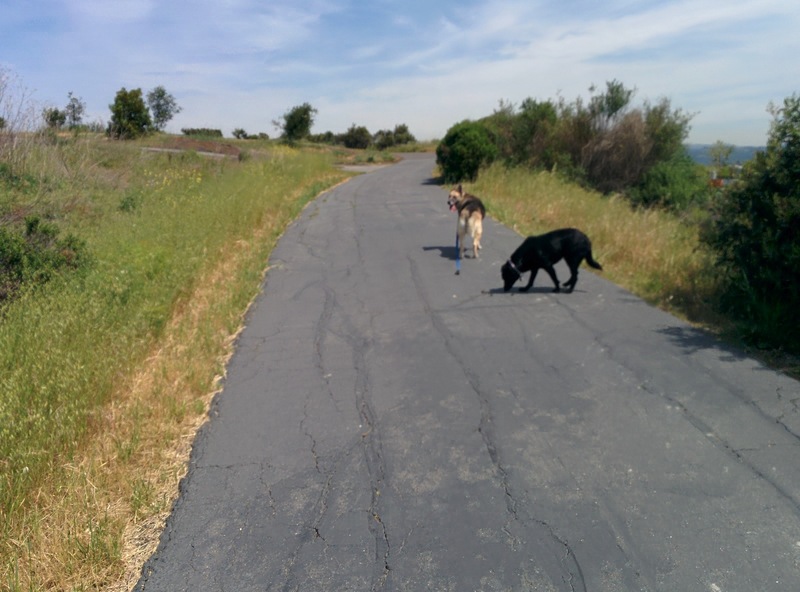 Around the outer edge of the park is an asphalt path that is used for cyclists, walkers and dog walkers. Part of the Asphalt Path Around the Perimeter of the Park. That’s Willow and Her Buddy Juneau. This part of the park and around the picnic areas and the immediate entrance to the park are the only places dogs need to be on the leash. A multitude of ground squirrels (Squirrel !) live among the chunks of concrete rip rap that line the shoreline to help keep erosion at bay. 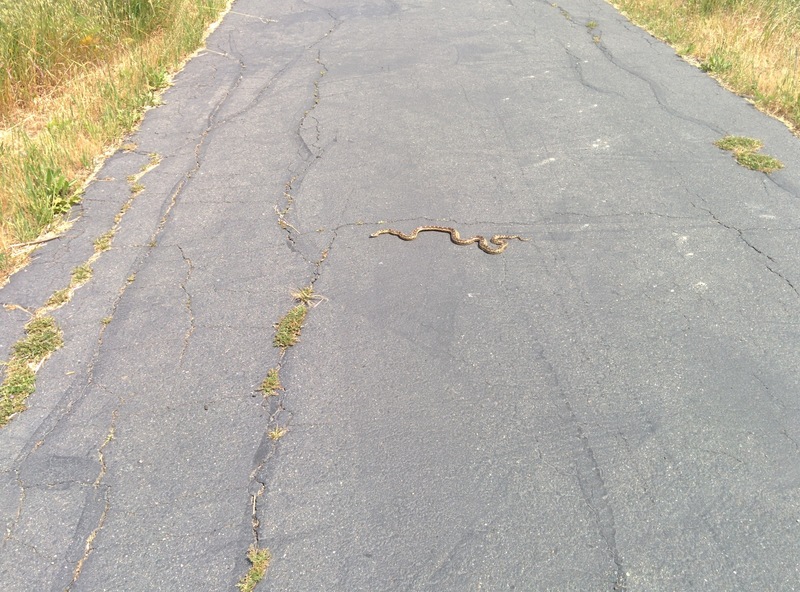 Every once in a while you might come across a harmless (unless you are a small ground-dwelling mammal) gopher snake out sunning itself on the path. That one was quite happy there and was none too amused when we moved him off into the bushes and out of the path of bike tires and overly inquisitive dogs and children. You’re welcome Mr. Snake. While there are some nice views to be had of the Bay Area and planes coming in to land at Oakland International Airport we really don’t come to places like this to be on leash and have to dodge bicyclists who have apparently forgotten the nicety of calling out “On Your Left” as they approach you from behind thereby surprising both dog and handler alike. Instead we like to head into the interior of the park and criss cross to and fro among the dirt paths that wildlife and walkers have created over years of walking as well as the tire tracks left by contractor’s trucks as they regularly check the testing wells that dot the landscape. These wells are there to monitor any nastiness leaching from the old landfill underneath the existing park area. Two by-products of decomposing refuse in a covered landfill are liquid leachate and landfill gas. Leachate, the nasty liquid made up of decomposing refuse and all the chemicals leaking out of cracked and decomposing bottles over the decades (think shampoo, motor oil, mouthwash, laundry and dish soaps, etc and other nasty items like baby diapers and rotting dead pets) that would be undesirable should they enter the groundwater. This is collected and piped to a wastewater treatment facility nearby. The gas is also collected and sent to the existing waste collection facility directly next door to the park where it’s burned. Over by the picnic area there are pit toilets, picnic tables with BBQ grills and trees to offer shade. 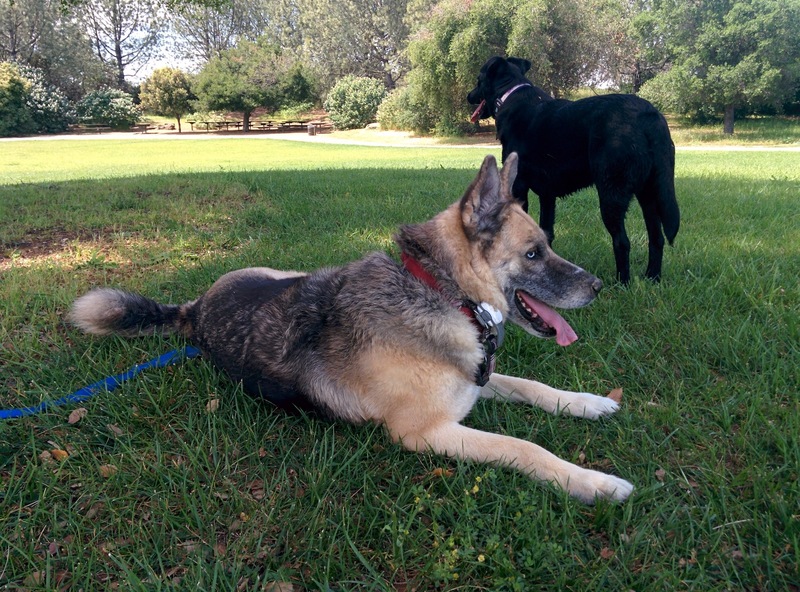 Dogs Taking Advantage of the Shade After a Long Romp. If you or your doggie companions so desire there are numerous places to scramble down to the water of the bay and have a cooling dip. Besides the ground squirrels (Squirrel !!) in the rocks lining the bay trail area there are also a cadre of rabbits that, although I know do not really like it, seem to revel in leading dogs on 20 minute romps over hill and dale and through forests and thickets. Never once has any dog I have taken there been successful in catching a rabbit although almost every one, from chihuahuas to German Shepherds have given it a go. Fun Fun…unless you’re the rabbit. Did We Mention SQUIRRELS !! * Good Dog Dug. With a few exceptions the rest of the park area is open with tall grasses and scrub brush scattered throughout. Open Grassy Area of the Park. Juneau and Willow Again. Dirt Path and Scrub Brush Lining a Trail. More Juneau and Willow. If you are into the sport of Geocaching the park has more than a few caches for you to find, some harder to find than others. 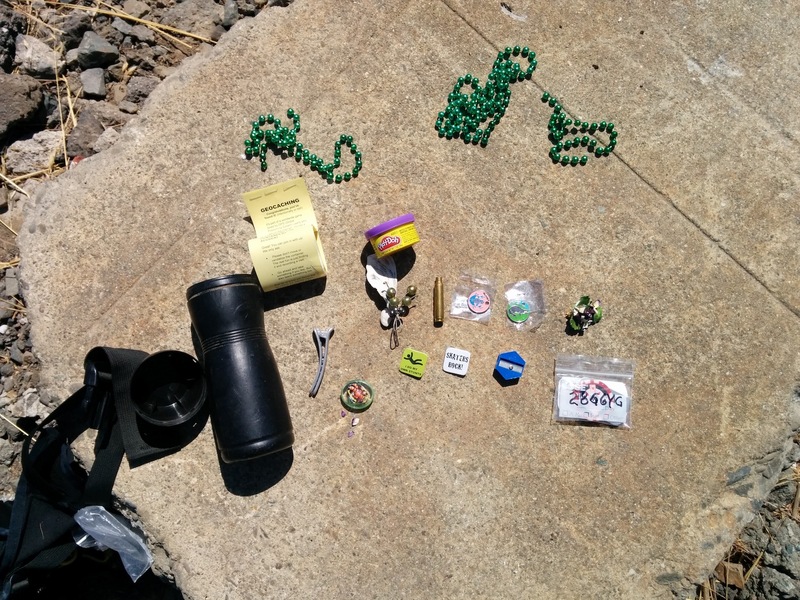 The geocaching community in the area seems to be active and enthusiastic so the caches are usually filled with numerous tokens, Travel Bugs and other fun items. 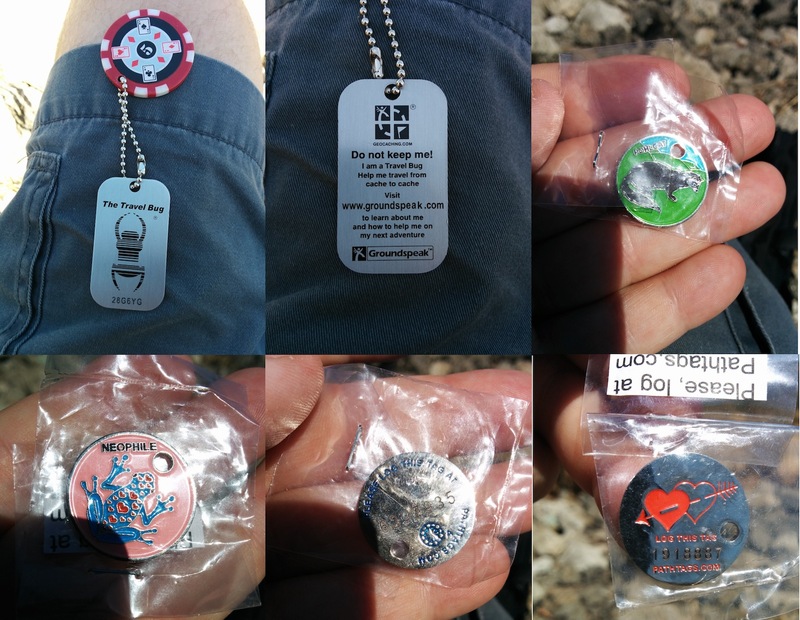 When given the opportunity we always try to take one or two of the trackable tokens and move them into another geocache as far as possible away. We aim for at least one state away from its last known position. 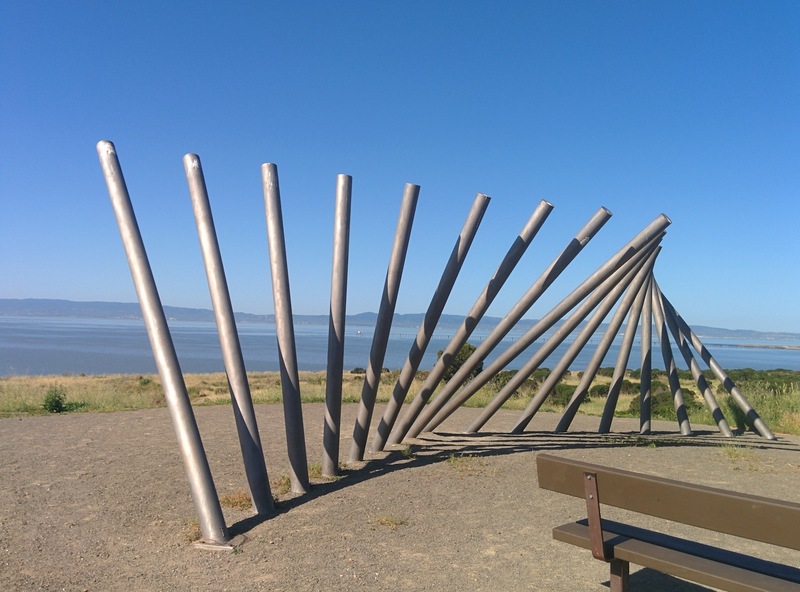 One of the prominent landmarks in the park is the Rising Wave Sculpture by Roger Berry which sits up on a rise at the highest point of the park. Made of stainless steel it stands 10′ h x 36′ w x 12′ d. Depending on where you view it from it “changes shape” and looks different from each vantage point. We like it. Simple idea brought to effective existence. Several times we have been fortunate enough to be able to do a successful rescue of a lost, wandering or dumped dog here. The last time we were here we came across a smaller, cute, friendly, male pit mix who was wandering around the parking area frantically looking for his owners. A professional dog walker had leashed him and was thinking about doing the rescue but did not want to put the dog in with her six other dogs in the back of her truck both because she didn’t know the dog’s temperament in close quarters or if it had any communicable doggie diseases it might pass on to her charges. 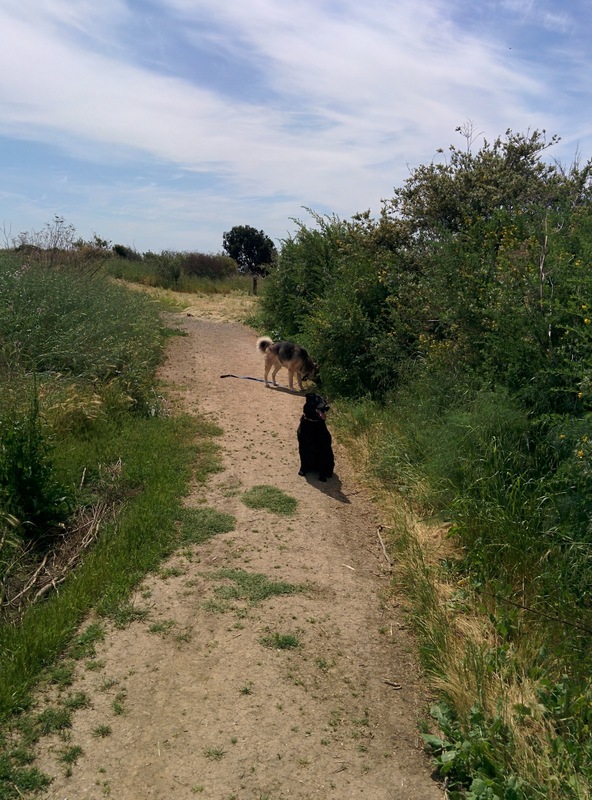 We stepped up and said we would do what we could and used our tried and true Ruffwear Just-A-Cinch leash to take control of him and, not wanting to deprive Willow of her romp, took him with us on that day’s park trek. After our walk and a water break we put our new charge back in the Tacoma shell and Willow jumped up onto her normal spot in the passenger seat thereby solving both possible problems of diseases and fighting. 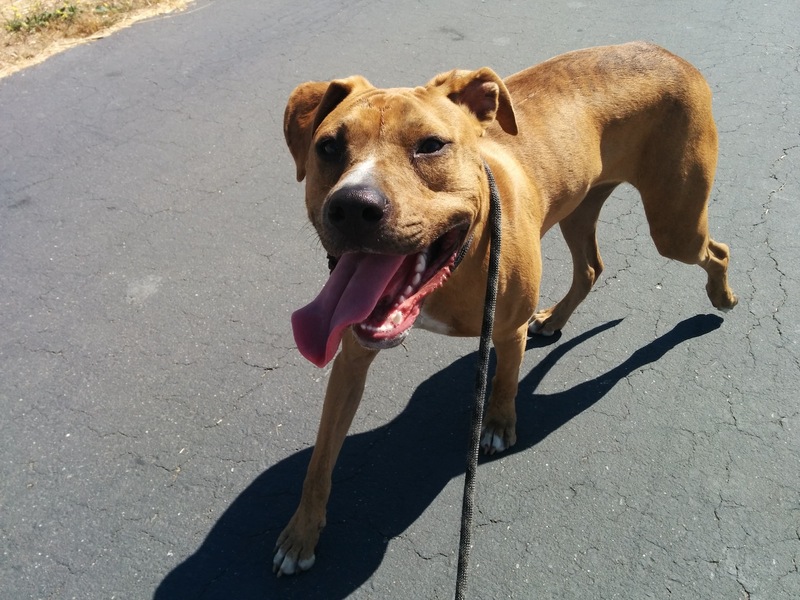 We called the San Leandro Animal Control Unit and was told the officer on duty was in another county for the day for some reason or another. 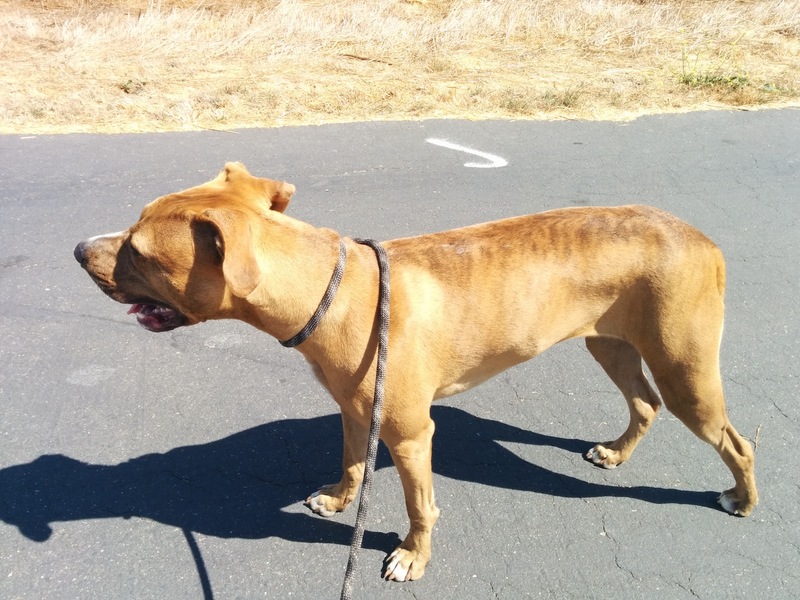 We were instead invited to take him to the San Leandro Corporation Yard where they have an outdoor kennel where he could wait for the officer to return, scan him for a microchip (since he did not have a collar or tags on) and hopefully be returned to his rightful owners or put up for adoption if he was a suitable candidate. We left our number with the ladies in the corporation yard office and asked to be notified about the little boy’s eventual outcome. Happily only a few hours later we got a call that his humans were able to be contacted and were extremely happy to get their dog back. The ladies mentioned that the dog was obviously excited to see his humans so that makes us happy as well as, sadly, more than a few times we have seen a rescue get reunited with its human and you can just tell that the dog is not a fan of them and does not have a great life. Unfortunately, what we consider a less than happy life rarely rises to the legal definition of neglect or abuse so there is nothing legal to be done about it. But, at least this time we had a happy ending. Before you go or when you leave you can also drive to the end of Marina Blvd which is right there as well. 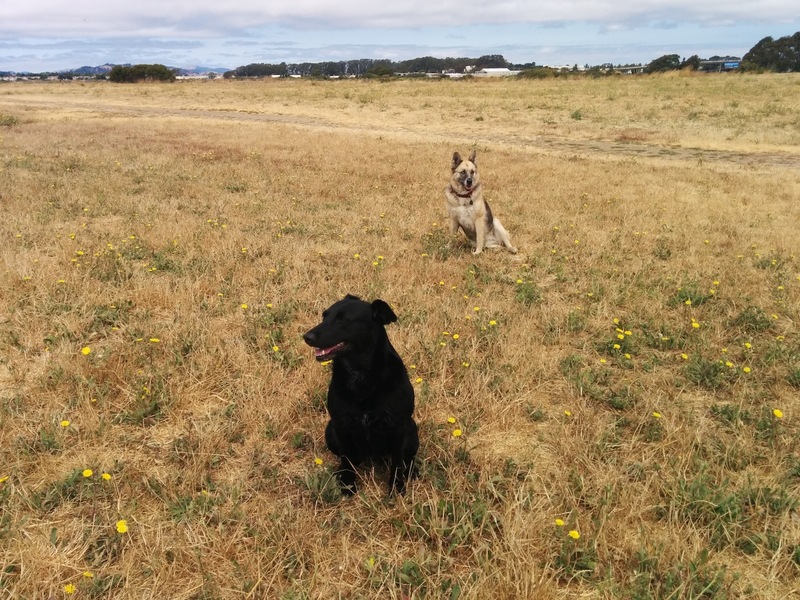 There you will find a couple of restaurants, a hotel, a marina, another park and numerous picnic areas and playgrounds, a Par Course, a public golf course and the official San Leandro Dog Park if you need or want small, fenced in, separate areas for small and large dogs area. If you ever find yourself in the San Francisco East Bay Area and need a place to take your dog or to just take a nice walk with beautiful views of the Bay Area you can’t do much better than make a visit to the Oyster Bay Regional Shoreline or one of the other members of our doggie romp triad, Pt. Isabel or the Albany Bulb. 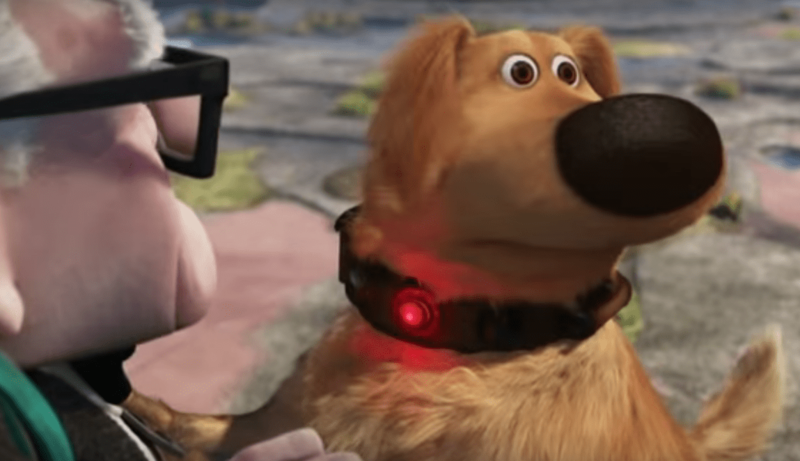 * Screenshot copyright from the Pixar/Disney movie Up. Totally used without permission. Hi! Oyster Bay is super awesome. I take my dog there regularly. It’s also really nice if you have a dog that is just learning how not to be afraid of other dogs, or how to recall (come when called) around other dogs; you can see all around you for long distances and move to a distance your dog can respond to you, unlike on windy trails in the woods where you can’t see around the bends. 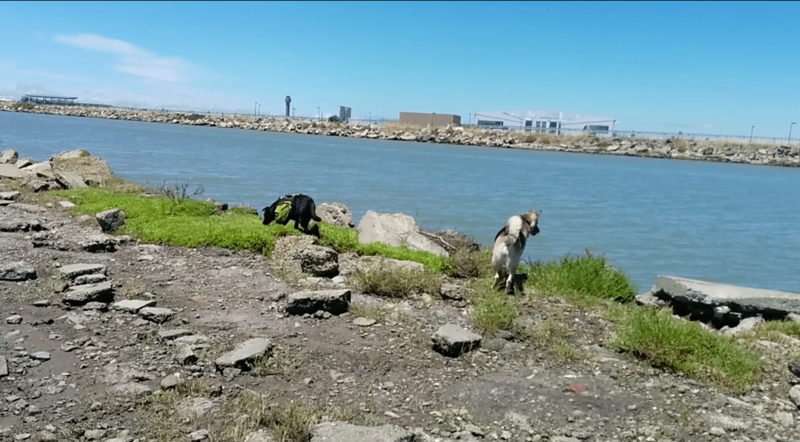 The only not good thing: Today my friend and I let our dogs go into the water, or what was left of it since it was pretty dry, and the two of them came back up the bank covered in a black oily substance. They smelled like motor oil and tar and rotting ocean water. We’ve bathed them thoroughly, but a bit of the scent remains. Happy dogs though! Hi and thanks for writing. Sorry to hear about your experience with the oily substance. The SF Bay seems to regularly have issues like that. 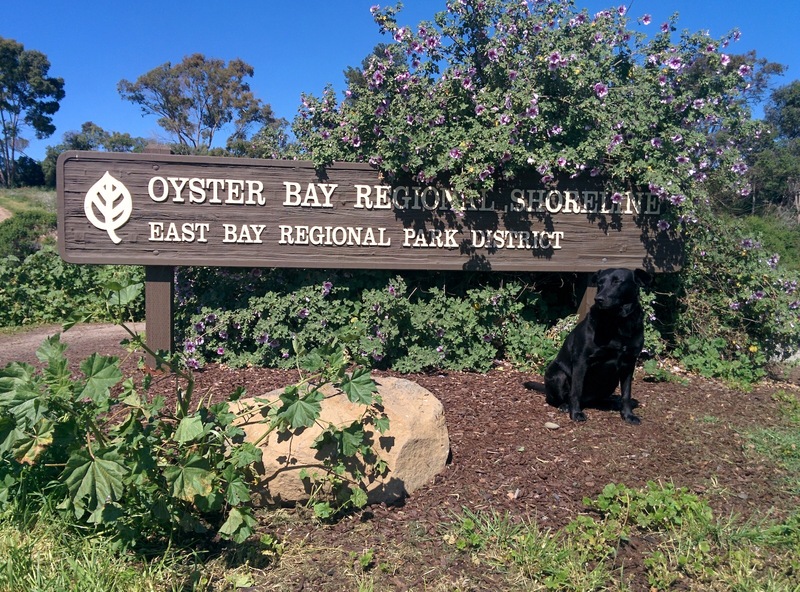 We’ve been lucky so far and only seen warning to look out for tar balls at the Albany Bulb and for an oil spill that affected Point Isabel for a few days.